The race takes place at a local church and is really family-friendly, which means that there are a lot of kids. Luckily, they made a big deal about only letting people who could run 2 miles UNDER 15 minutes at the front, which stopped some of the younger kids from getting caught up in the start and making things too chaotic. (For the record, I didn't join the speedy folks at the front, despite *spoiler alter* eventually finishing under 15 minutes). At the start, I had my eye on a lady who typically finishes ahead of me and tried to stick with her. The first mile was 7:04, which made me so excited, because part of it was uphill. Clearly that wore me out, because even with the corresponding downhill on the second mile I slowed right down. It was hard. I was out of breath. But it was awesome. Yep, I'll take that. I had a goal of 15 minutes for this race, and I got there with a few seconds to spare. It took me a couple of minutes to breathe properly afterwards, which I think means I worked for that time. Isn't that the best case scenario? Wanting to die during the race but feeling amazing after the fact? Perfect. Of course, scooping up some bling was fun too. Loved that part a little bit. 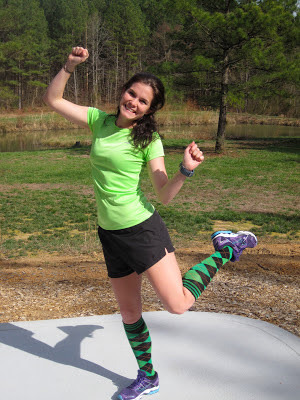 Anyone else run a St. Patrick's Day race this weekend? Just a heads up...I had someone email me about running a race this with IT band pain, which is a valid question! I understand that I am treading a fine line between resting, strengthening the area and maintaining my running fitness. I feel lucky that I have almost no pain as long as I foam roll before a run and warm-up properly, but that isn't the same for everyone! I have to say I love the socks!!! Where did you get them? and AWESOME job on the time!!!! They're from Target - but last year. Not compression socks, just for fun! Woohoo, congrats on a great race and coming in under your goal time!!! How are those kitties anyway? Congrats on the PR and I like your festive attire! 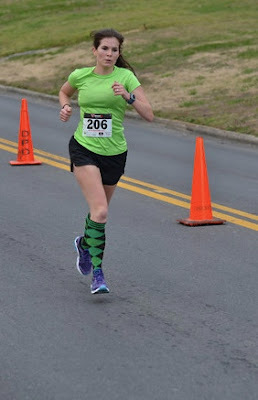 I ran a 5k Saturday and didn't wear a lick of green, and I even own a green Tshirt. But I did wear orange, and I'm Protestant, so that's right anyway, huh? Congratulations! 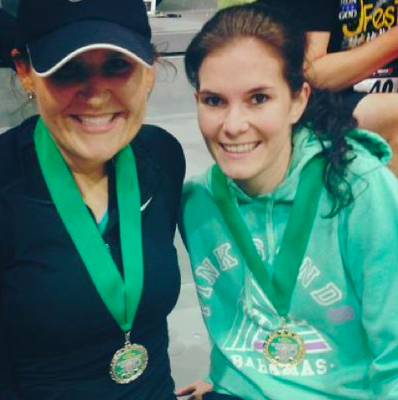 You are just PR'ing the heck out of every race you run! Nice job Vanessa! sounds like your husband and mine have a lot in common :) GREAT JOB!! Wow, Ms Speedy! Great job. I have to say, I didn't know there were TWO mile races! That's an interesting distance, as I wouldn't really know when to put on the gas and would probably go out too fast and poop out in the end! You totally look like the actress Kate Mara. Random, I know. Congrats on the age group win! Nice job being speedy and looking good doing it! I don't know that i have ever done a 2 mile race, but wouldn't mind trying sometime, always fun to get an automatic PR. I didn't even know there were such things as two mile races. Nice job!! congrats on the pr! 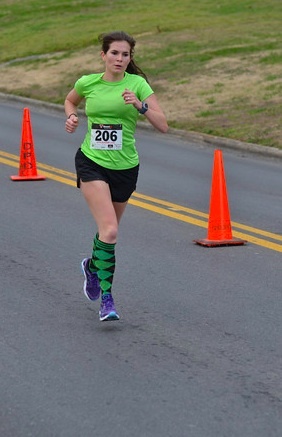 that's a cool photo of you at the finish with a beautiful stride ;) i'm running a shamrock 8k, but not until april 7th. weird right? Stop being so cute. Okay, don't stop...I love it. Danggg girl you dropped some speed on it! Congrats! Speedy McSpeederson! Great work, lady. Can I say AMAZING...GREAT TIME! You are such a fast girl! When did you get so dang fast?!?!?! Woohoo!!!! NICE! Super speedy! Way to make the husband go, you know he secretly loved it. 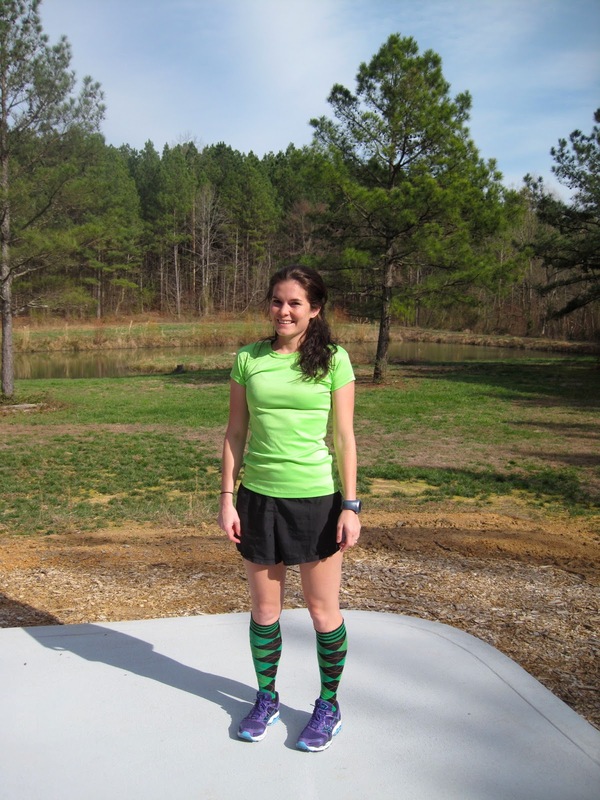 This was the first year in a long time that I didn't run a St. Patty's Day race! You look smoking fast in that running picture. Congrats on such a speedy race! Congrats Vanessa! Cute outfit and hooray for winning your age group! WOW! That is amazing! I cant even run ONE mile as fast as you average 2! Great job!! Amazing!!! So fast!!! Congrats on the first place for AG! Very impressive!! !